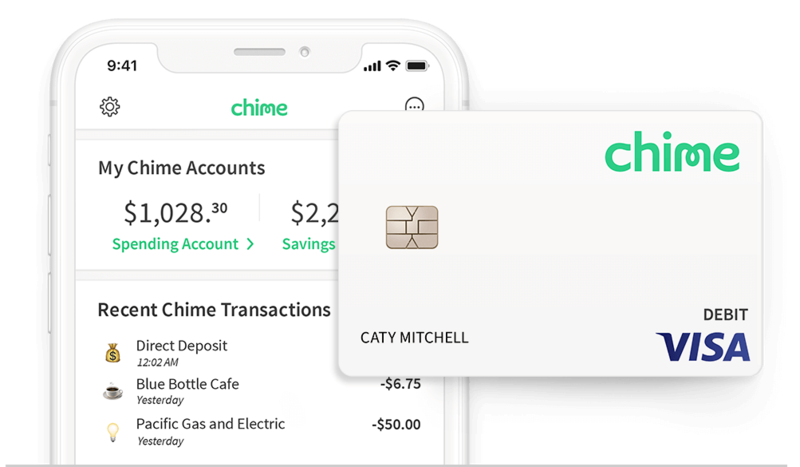 At Chime, we’ve created a new approach to banking that doesn’t rely on fees, gets you your paycheck up to 2 days early, and helps you grow your savings automatically. When you open a Chime bank account, you get a Visa Debit Card® and a Spending Account that can be managed entirely from your smartphone, plus an optional Savings Account that helps you grow your savings automatically! The Chime mobile banking app is available on both Android and iOS. Our mission is to make financial peace of mind a reality for everyone. We’re doing that by changing the way people feel about banking. Chime’s business was built on the principle of protecting our members and making managing your money easy. We’ll never profit from your misfortune or mistakes and everything we build is focused on improving our member’s lives. So, how does Chime make money? Unlike traditional banks that may charge consumers fees left, right, and center, Chime makes money from “interchange.” Every time you use your Chime Debit Card, Visa processes the transaction and charges an interchange fee for the service. We get a percentage of that interchange fee every time you use your Chime Debit Card, which means we never have to charge you those unnecessary fees to run our business. It’s a win-win for everyone! U.S. Citizens 18 years an older are welcome to apply! While Chime cards work all over the world, currently we can only offer accounts to members with a valid SSN, living in the United States and District of Columbia. Does Chime charge any fees? We don’t believe in unnecessary fees or profiting from our members’ misfortune. We have no fees to sign up, no overdraft, no monthly or service fees, no minimum balance fees, no transaction fees, and no card replacement fees either. We do charge one fee ($2.50) for over the counter cash withdrawals or using an out-of-network ATM that is not part of Chime’s fee-free network of 38,000 ATMs. Please note that third-party money transfer services used to deposit or withdraw funds to your Chime Spending Account may impose their own fees per transaction. What is Chime's ATM Network? We have a network of 38,000+ fee-free ATMs for Chime members through our partners: MoneyPass® and Visa Plus Alliance. To find a fee-free ATM near you, download the Chime mobile app and tap on ATM map. You can also search our ATM network. What type of cards does Chime offer? When you open a Chime Spending Account you get a Chime Debit Card that can be used at any merchant that accepts Visa. Your Chime Debit Card can also be used with mobile-payment providers such as Apple PayTM, Google PayTM or Samsung PayTM. Other features our members love about our Chime Visa Debit Card are instant transaction notifications anytime your card is swiped, the ability to instantly block your card and order a replacement Debit Card all from within the Chime mobile app. We do not offer a Credit Card option yet, but this is something we are working on! We also support mobile check deposit and electronic transfers from other institutions by linking an external bank account and in the Chime mobile app. Cash deposits can also be made to your Chime Account at over 60,000 retail locations such as Walgreens, CVS and 7-Eleven using the Green Dot® Network. Can I send money to family/friends? You can use our Pay Friends feature to send money to Chime members instantly, and free! To use the Pay Friends feature, simply log into your Chime mobile app and select the ‘Move Money’ tab, then select ‘Pay Friends’. You will then be prompted to enter in either the receiver’s name, phone number or email, or you can select them from your contacts. Can I send paper checks? Though we do not provide physical checks to our members, we do have our Chime Checkbook feature which is 100% free and allows you to send checks directly from your Chime mobile app to anywhere within the 50 United States! Checks typically take 3-9 business days to arrive. Can I pay bills using my Chime bank account? Yes, you can! You can pay bills such as your rent, mortgage, credit card or loan payments electronically with direct debit (ACH Transfer) by providing your Chime Spending Account number and routing number to your billers. If you need to stop a payment please contact our Member Services Team right away. Can you use your Chime Visa Debit Card in other countries? You can use your Chime Debit Card anywhere Visa cards are accepted, including outside the U.S. and with no foreign transaction fees! International transactions can be enabled or disabled in the settings menu found in the Chime mobile banking app. Our Member Services team is always happy to help! You can reach us 24/7 via the customer support tab in the Chime app, or by email at support@chimebank.com. Our phone specialists are available Monday-Saturday 7am to 7pm CST, and Sunday 9am to 5pm CST through our customer service number at (844-244-6363). Our top priority is protecting our members. We use 128-bit AES encryption, access control, and security processes to ensure your money is always safe with Chime. If you notice an unauthorized transaction, you can disable transactions on your Chime card immediately in the settings section of the Chime app and website to prevent further unauthorized card transactions. Chime debit cards are protected by the Visa Zero Liability*** Policy to ensure that cardholders will not be responsible for unauthorized charges. Yes. All deposits into your Chime Account are FDIC insured up to $250,000 through our partner, The Bancorp Bank, Member FDIC. **Faster access to funds is based on comparison of traditional banking policies and deposit of paper checks from employers and government agencies versus deposits made electronically. Direct Deposit and earlier availability of funds is subject to payer’s support of the feature and timing of payer’s funding. *** You must notify your financial institution immediately of any unauthorized use. For specific restrictions, limitations and other details, please consult your issuer.